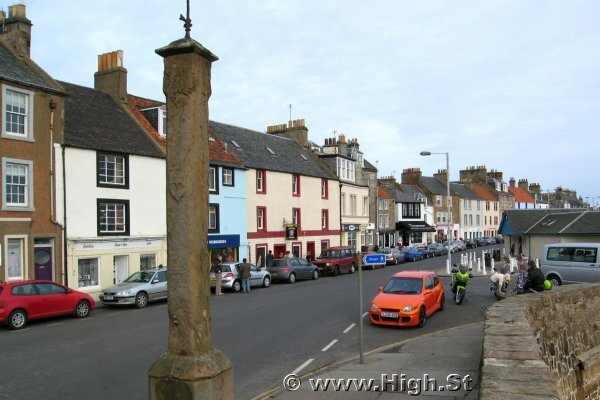 Anstruther High Street @ High.St - High Street shops and High St businesses. Large Google map of Anstruther High St.
Anstruther is a pretty little fishing village on the Southern Fife coast. The area is well known for its fishing and we recommend tasting some of the local catch in the many water-front restaurants. The Scottish Fisheries Museum is much bigger than it looks and provides a comprehensive history of fishing in Scotland. Whilst along this stretch of coast, don't forget to visit nearby Crail, one of the most photographed harbours in the area and known for its fossils. Also nearby and perhaps the reason you are in the area is St Andrews, famous for both its university and golf. We have used some artistic licence in listing the shops in Anstruther but you won't have any trouble finding them as its the route you might take when walking down first one side and then down the other. Starting at the top end of the Rodger Street we nip up and down the Western High Street and then back into Rodger Street to the sea front. For the shops on the other side, we go along the High Street on the Eastern side and then back down the hill until Rodger Street joins Shore Street. We then list the shops along the front, ending with the Fisheries Museum and Tourist Information Centre.